The ideal aquatic exercise and therapy pool for rehabilitation and training, the WaterWell Therapy Pool by Endless Pools provides chest-deep water in a freestanding package that fits just about anywhere. 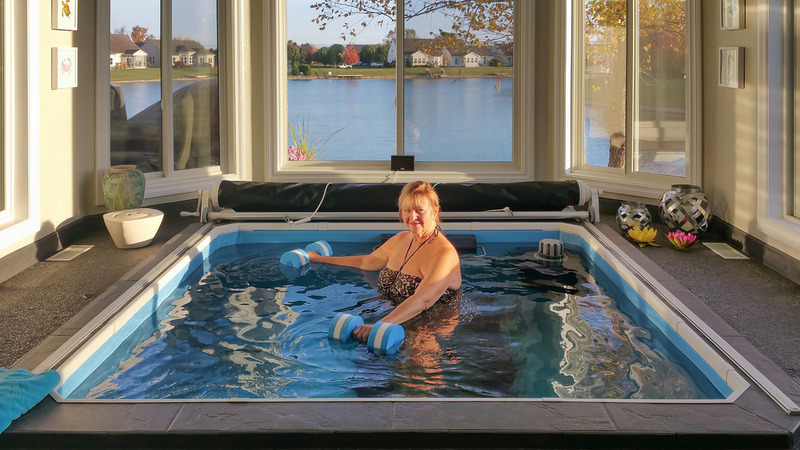 The WaterWell Therapy Pool’s unique combination of heat, water and motion gives many people a respite from chronic pain and stiffness, improves circulation, increases flexibility and relieves muscle spasms. A convenient bench provides another workout station and our optional treadmill allows you to walk, jog, or even run. Easy to install in new or existing rooms, all components fit easily through doorways and down stairs. Available in a variety of sizes and depths, we can customize a WaterWell for your specific fitness needs, goals, and lifestyle. no-hassle maintenance—just without the swim current. Available in multiple sizes and depths, the WaterWell is an Endless Pool without the swim current. Simple to install, the WaterWell is completely self-contained. All filtration, heating and sanitizing equipment fits beneath the skirting and plugs into a dedicated 220v, 30 amp GFCI circuit.